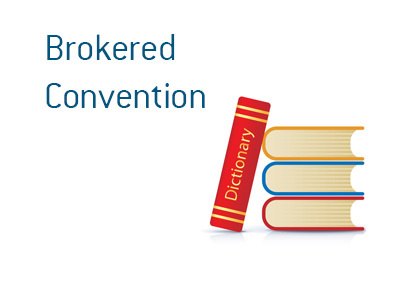 Brokered Convention - What Does It Mean? What does the term "brokered convention" mean in the world of politics? What is meant by a brokered convention? A "brokered convention" occurs when any single candidate is unable to secure a majority of delegates after the first vote at a nominating convention. If a candidate does not have a majority of delegates on their side after a first ballot, all of the delegates then become "free agents" and can vote however they want in subsequent votes. Almost all states have a binding primary or caucus, which means that many delegates must vote based on the results of their contest. For this reason, the candidate who will officially be nominated is almost always known before the nominating convention. The Republican candidate for President in 2016, for instance, will need 1,237 delegates in order to secure a majority. If any single candidate is unable to secure 1,237 delegates after the first vote at the nominating convention, all of the delegates will become "free agents" and the process will devolve into chaos. At this point, the various candidates will try to persuade delegates to vote a certain way. In the case of a possible brokered Republican convention in 2016, a candidate such as Marco Rubio or Ted Cruz may try to rally support in order to steal delegates away from Donald Trump. At a brokered convention, discussions amongst delegates and candidates continue until a majority vote is achieved. In this day and age, brokered conventions are quite rare due to the "bandwagon effect". When momentum starts to build for any one particular person, other candidates will usually drop out, creating a strong favorite. For this reason, the nominated candidate is usually known long ahead of time before the nominating convention.